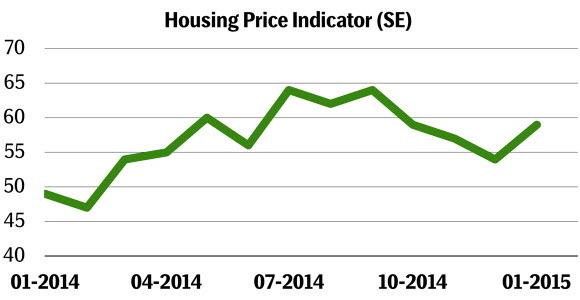 SEB’s Swedish Housing Price Indicator rebounded in January to 59 from 54 in December last year and remains at historically very elevated levels. The indicator continues to signal scope for a further acceleration in home prices. There are signs that prices have started to rise more rapidly also on houses, and not only flats. According to the survey, 69 per cent (66 per cent in December) of Swedish households expect home prices to rise in the coming year, while 10 per cent (12 per cent in December) foresee declining prices. The largest increases in the indicator were seen in the South-East region and in Stockholm, with the latter remaining the most optimistic on home prices. The rebound in house price expectations could be a sign that households have taken note of dovish Riksbank signals that rates will remain at zero for a prolonged period of time and that the Riksbank may also introduce unconventional policy measures to combat risks for declining inflation expectations. This view is supported by waning appetite to fix rates. In January the share of households intending to switch to fixed mortgage rates within the coming three months declined to 3 per cent (December 5 per cent) which is close to record low levels. The main threat to household's home price expectations is probably risks for further regulatory changes to fight accelerating household lending. The financial market minister has initiated talks with the opposition on whether to limit the scope for deducting rate costs from taxes. However, this would be a highly unpopular measure and we see limited probability for such a decision currently. The survey may also reflect less uncertainty over the political situation following the December agreement between the Left-Green government and the Liberal-Conservative opposition which averted the threat of an extra election in March.